One sunny, breezy, afternoon in Pixie Hollow, Tinker Bell sat in her workshop, frowining at a copper pot. With one hand, she clutched her tinker’s hammer, and with the other, she tugged at her blond bangs, which was Tink’s habit when she was thinking hard about something. The pot had been squashed nearly flat on one side. Tink was trying to determine how to tap it to make it right again. All around Tink lay her tinkering tools: basket full of rivets, scraps of tin, pliers, iron wire, and swatches of steel wool for scouring a pot until it shone. On the walls hung portraits of some of the pans and ladles and washtubs Tink had mended. Tough jobs were always Tink’s favorites. 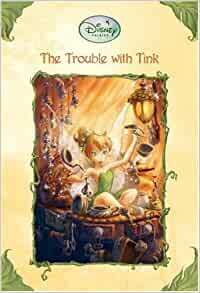 Tink was a pots-and-pans fairy, and her greatest joy came from fixing things. She loved anything metal that could be cracked or dented. Even her workshop was made from a teakettle that had once belonged to a Clumsy. Ping! Ping! Ping! Tink began to pound away. Beneath Tink’s hammer the copper moved as easily as if she were smoothing the folds in a blanket. shadow fell across her worktable. She looked up and saw a dark figure silhouetted in the sunny doorway. The edges of the silhouette sparkled. “Oh, hi, Terence. Come in,” said Tink. Terence moved out of the sunlight and into the room, but he continued to shimmer. Terence was a dust-talent sparrow man. He measured and handed out the fairy dust that allowed Never Land’s fairies to fly and do their magic. As a result, he was dustier than most fairies, and he sparkled all the time. “Hi, Tink. Are you working? I mean, I see you’re working. Are you almost done? That’s a nice pot,” Terence said, all in a rush. “It’s Violet’s pot. They’re dyeing spider silk tomorrow, and she needs it for boiling the dye,” Tink replied. She looked eagerly at Terence’s hands and sighed when she saw that they were empty. Terence stopped by Tink’s workshop nearly every day. Often he brought a broken pan or a mangled sieve for her to fix. Other times, like now, he just brought himself. As Terence rambled on, Tink looked longingly at the copper pot. She picked up her hammer, then reluctantly put it back down. It would be rude to start tapping right now, she thought. Tink liked talking to Terence. But she liked tinkering more. “Anyway, Tink, I just wanted to let you know that they’re starting a game of tag in the meadow. I thought maybe you’d like to join in,” Terence finished. Tink’s wing tips quivered. It had been ages since there had been a game of fairy tag. Suddenly, she felt herself bursting with the desire to play, the way you fill up with a sneeze just before it explodes. She glanced down at the pot again. The dent was nearly smooth. Tink thought she could easily play a game of tag and still have time to finish her work before dinner. Standing up, she slipped her tinker’s hammer into a loop on her belt and smiled at Terence. My daughter loves this series and I enjoy them as well... which isn't the case with allot of kid's books. 5つ星のうち5.0Ok so this is not like the movie. I am reducing the amount of books I have in my office and figured this should go to the little library so another child could enjoy it. I had never read this as my daughter wanted to do that on her own. I assumed this was a version and or inspiration for the Tinker Bell movie. It's not. It's basically a story after the events with Peter Pan. Tink was using her talent of fixing pots and pans and took a break to play fairy tag with her friend Terrance and the other fairies. It was great fun until the game was broken up by the presence of a hawk. She heads back and finds she lost her tinkers hammer. She looks all over the place but can't find it. Tink tries to use replacements but they all go bad. Bad enough for the kingdom to think she had lost her talent. Bad enough for Vidia to torment her and tell her the Queen would to see Tink. Tink is embarrassed and can only tell one fairy what happened. There is only one thing that can be done. She has a spare hammer and it's with Peter Pan! Things did not go well when that Wendy appeared! This was a fun little read. It's simple and has pictures. An advanced reader can finish this in one sitting. See my full review at museonmedia.com. Ever since I saw the Disney classic version of Peter Pan I’ve had a great affection for Tinker Bell (as many other’s did too…she is a popular culture icon now and all). When the movie Tinker Bell was being release I was so excited because I thought it might be a prequel starring Tinker Bell meeting Peter Pan or something. When the series ending with Legend of the Neverbeast I was incredibly disappointed that Peter had absolutely no part in Tinker Bell’s world. After I found out that Peter Pan was going to be in this book, I immediately purchased it. My excitement on Peter Pan finally being a part of the Disney Fairy universe was at an all time high and I couldn’t wait to read this book! No one else on the whole island of Neverland (excluding Peter Pan, the lost boys, and the all-knowing Mother Dove of the island) know about the past between Tink and Peter. For Tinker Bell, Peter Pan is her little secret and I love it! When I was reading I felt like the way that Tinker Bell and Peter were portrayed was as former lovers, which I got a kick out of. Seeing as this is a book aimed for children, I think the tone was unintended, but nonetheless I felt it there! Throughout the story, everywhere that Tinker Bell goes she is reminded of Peter and what was. It was such a delight to see Tink remember Peter so fondly (in a totally platonic way). In fact, I was so drawn in by the friendship that these two used to have that I was kinda disappointed that Tink didn’t want to stay with Peter. Tink said she belonged in Pixie Hollow fixing pots and pans, but I think that she belongs with Peter going on adventures. Enough about Peter and Tink though (let’s face it…it’s never enough, their friendship is amazing)! This book was an introductory chapter book, so of course there were a few illustrations. These illustrations were pretty and I think that they added a lot to the story. It’s nice to see the characters in full color. I felt like the art is more closely mimicked to the original 1953 classic, which for me (who grew up with the classic) is an absolute bonus.